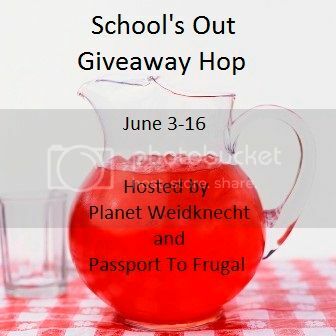 School's out, let's get the Old Fashioned Ice Cream Maker turning! 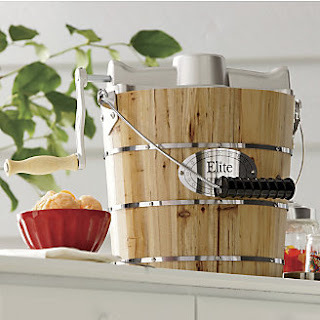 This 4 QT Elite brand Ice Cream Maker can be turned the old fashioned way for great fun and refreshment this summer. Once the novelty of turning the crank wears off for the kids (if it ever does), you can use the motor. We are so excited to try this ice cream maker out! I will be posting pics and our thoughts on this product once we have our review item in hand. 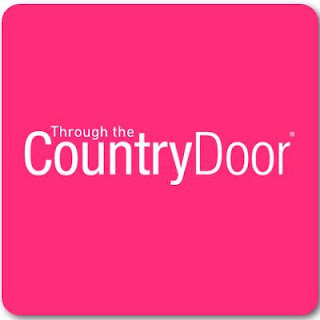 I thought this was a perfect product for this giveaway hop and wanted to offer one to you from Country Door before I even try it out myself! Country Door has some beautiful summer decor items as well as beautiful home furnishings and products. All elegantly displayed in their online catalog. Easy to shop, quick delivery and fantastic prices. I love the wooden play cottage! I also adore the Wooden Play Cottage. My son loves playing house currently and it'd be perfect for him. I like the Elegance microfiber sheets. I really love the Dragonfly Swing Chair! It's perfect for slow swinging in the sunshine with a book! Several things I really like - one is the Celebration Wreath. Thanks. I love the Dazzling Lighted Peacock. Love the chilled condiment caddy. I love this Solar Lantern, Butterfly, we live in country and it would be great to have some extra light source at night, without running electric wires..
Wow, I could spend a fortune there! I love the American Flag wall art. I like the Grill Gazebo. You can grill even when it's raining. I like the American Flag wall art. Oh my how to choose just one~ they have so many lovely things! But i really would like to have one of their Bright Oversized Floral Anywhere Rugs! I love everything-i really liked the set of three planter buckets in red white and blue. Would be so pretty for July! I also like the Sundance Mosaic Firetable. I really love the gazebo; if only I had enough money. The gazebo is stunning but I also really like the Retro Cotton Candy Maker by Nostalgia Electrics a lot! I have a hotdog roller and popcorn maker that match so that caught my eye very quickly! However, everything is so nice there, I didn't want to stop looking! Thank you for the giveaway chance. The "Praise America Musical Figurine"
The Dragonfly Swing Chair is just stunning. I love the Red Roof Wooden Play Cottage! My kids would have a blast with it! I love the Log-Cut Pine Picnic Table and 2 Benches, this wold look great on our deck! I love the Red Roof Wooden Play Cottage. It would look so cute in my garden. The grandkids would love it. I really love the Red, White & Blue Wooden Birdhouse!!! I love the Retro Snow Cone Machine! I like the Retro Snow Cone Machine. I've narrowed my answer down to two items: the Red, White & Blue Wooden Birdhouse and the Celebration Wreath. Love the 8 panel raised garden bed, no more slouching over to garden and the dogs are less likely to get in it. I like the solar mood lights. I love the star bowls. I love the heritage pull down flag. I love the red roof wooden playhouse. I like the Classic Summer Wreath! I like the Two-tone Storage Ottoman. I love the Red Roof Wooden Play Cottage. The kids would really love it.Very Cool. I love the 55-Gallon Rain Barrel! the Red Roof Wooden Play Cottage. I love the Jim Shore in Praise of America Musical Figurine. I love the sunshine quilt! I like the Set of 2 Solar Mood Lights! I really like the American Flag Wall Art. I love the Screen Door Plant Shelf! I like the Set of 3 Star Bowls. I like the Red Roof Wooden Play Cottage. I love the Butterfly Solar Lantern. I love the retro snow cone maker too. I love the Sundance Mosaic Firetable and the Potting Bench. lots of nice things! I like the solar lantern butterfly! I love the American Flag Wall Art. I love the Tristan Hall Tree! They have some really nice things! I love the Triumph Sports 2-In-1 Tournament Game Pack! Great for summer camping and BBQs. love their retro snow come machine! I love the personalized kids rockers. They have such cute shapes to choose too, a butterfly, daisy, heart, or they even have a princess one. I love the red inflatable buffet! I love the Sleepy Fairy Gazing Ball it's so cute. Where to start? Such beautiful items! I really like the Window hummingbird feeder.And the watering can wind chime.The solar Turtle lights are adorable! I could easily go overboard! I love the Set of 2 Americana Trunks. Would look nice in my living room. I love the Solar Lantern, Butterfly. I love the red roof wooden play cottage. The Petunia and Buzzy watering cans are ADORABLE! I love the Red, White & Blue Wooden Birdhouse. I really like the Red Roof Wooden Play Cottage. I love the decorative garden breeze with planters. The Dragonfly Swing Chair looks so comfy! I like the flag star pillow! I love the hand hooked blossom rug. The 10" Lime Cooler by Deco Breeze ™ would look awesome on my kitchen counter!! the set of three star bowls is perfect! i love them! Good Morning, I love just about anything that is red, white and blue or the American flag, but I have chosen: Red Roof Wooden Play Cottage. Thank you. Vicki. I love the Solar Lantern, Butterfly it is so cute! Like the Fan-Fold Pleated Bunting. I love the white porch rocker! I love the Ultimate Lounger. I like the Set of 3 Star Pinwheels. I like the Set of 2 Solar Mood Lights. wow, love their stuff!! I like the solar mood lights. The Pig Watering can is really adorable. I live in a duplex with no yard, so I have to do container gardening and fence gardening. These would be perfect (AND they're totally affordable, too)! Thanks for the chance to win! The Teacup Flower pots caught my eye ! love the prize your offering to so much. https://twitter.com/FaithfulAcres7/status/344878513549111296 and I followed Country Door on twitter as well but hte things on the enter above do not work for me on chrome with twitter, not sure why but htey don't. It won't verify or allow me to sign on using Chrome. I love the solar mood lights, the solar butterfly lantern, and the Sofea 10" Tabletop Fan! Great products! I like the Button Daisy Wreath. Thanks. Absolutely love the set of 3 candle lanterns! I like the Red White & Blue Birdhouse. I like the felt appliqued accent pillow for Christmas! My grandkids would love the Red Roof Wooden Play Cottage. I love the owl bench! I love the pig watering can! So cute! I really like the Bright Oversized Floral Anywhere Rug. I would like Weather-resistant Wicker Swing. I like the Red, White & Blue Wooden Birdhouse. I love the cotton candy maker, I only get to have it once a year at the carnival and I've always wanted to be able to make it whenever. I love the Set of 3 Planter Buckets, these are perfect with my condo deck! I love the solar lantern butterfly!! Love the set of 3 candle lanterns! I adore the Dragonfly Swing Chair! I ove the screen door plant shelf but it was hard to choose. I love the Red Roof Wooden Play Cottage! I love the Retro Rolling Cooler! I would love the offset umbrella!